Take advantage of our low winter rates! 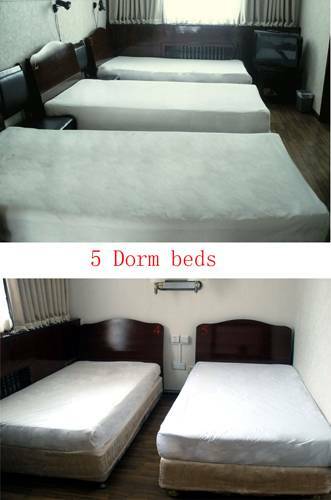 Experience Beijing hutong life with some of the cheapest beds in the city! Although Beijing can be quite cold during the winter, fear not our heating system is modern and allows you to comfortably enjoy your room at 9 Dragons House. Despite our low room rates, we vow to consistently provide the best service to you throughout the cold winter months in Beijing. And, in order to ensure your comfort, we will provide one FREE cup of coffee or tea to help you get through the cold morning of a Beijing winter. Our specially themed rooms that allow guests to experience a different side of China, including the Great Wall Room, the Temple of Heaven Room, and the Princess Room. If you are interested in these rooms, we will be happy to send you pictures of them allowing you to choose one of them if you so desire. And, regardless of which room you stay in, be it a themed one or one of our standard rooms, all come with a smile and the highest level of service from our staff. The 9 Dragons House hostel is located in a protected area. 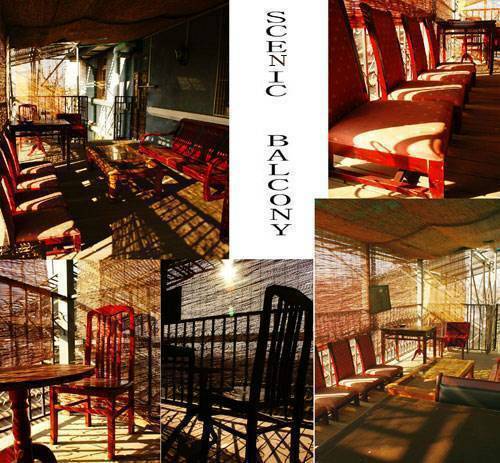 We have a balcony were you can sit and savour one of many famous Chinese teas while enjoying a panoramic view of this unique and rare Chinese architecture. 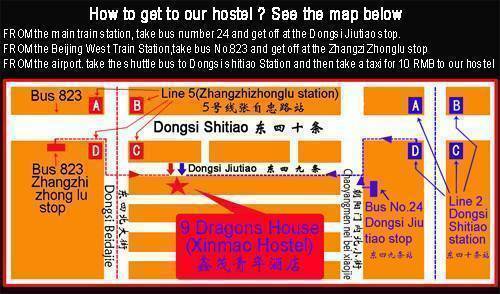 The 9 Dragons House hostel is located very near the new line 5 Zhangzizhonglu subway station. 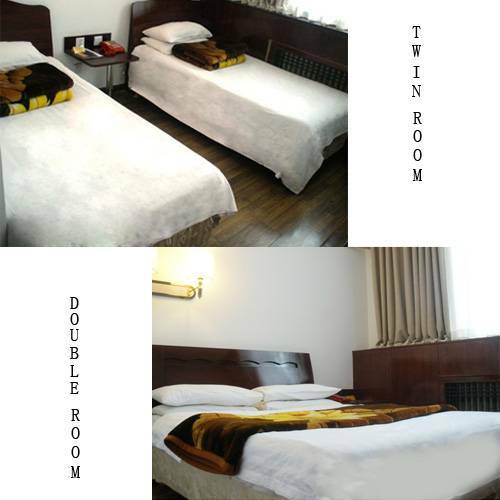 This optimum location allows you to conveniently and cheaply get to many of the main Beijing attractions. Our exceptionally friendly and helpful staff will even pick you up at the airport for just 80 RMB for one person and 140 RMB total for 2 or 3 people! And, if arriving by train, we are happy to meet you at the main train station and bring you back to our hostel by city bus for free. We can also pick you up at the west train station for 30 RMB. In addition to being located in a hutong, we also offer tours to the main Beijing tourist attractions that include NO side shopping trips. * delicious food include both chinese and Western-style in the restaurant. 9 Dragons House welcomes you to Beijing and we hope you enjoy your stay with us!! trips to the Great Wall at all sections including the Great Wall at Mutianyu, Badaling, Simatai and Jinshanling. Tickets booking of train, flight (both international and domestic) and ferry. 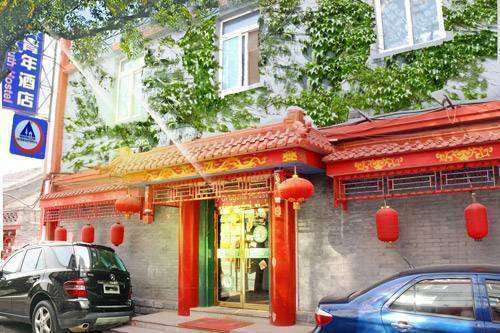 If you are looking to get a feel for Old Beijing near the historic HuTongs, live in a quiet area where you will hear Beijing dialect, yet enjoy the nearby convenience of modern Beijing. 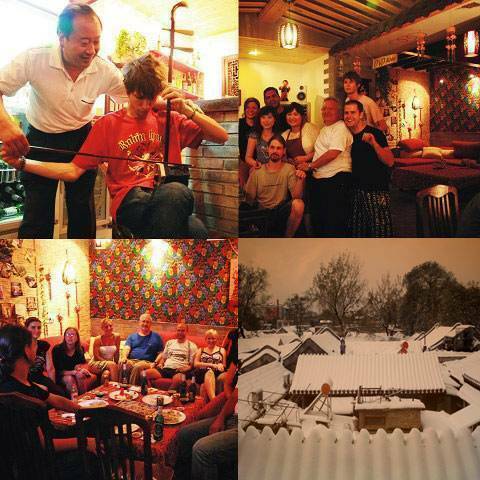 9 Dragons House, the home of backpackers in Beijing China. 9 DRAGONS HOUSE welcomes you and we hope you enjoy your stay with us! If you need to cancel your booking, please send us an email at least 24 hours before your scheduled arrival. If arriving at the Beijing airport, you can take the airport express bus or airport subway and get off at Dongzhimen. If coming by subway, you can switch to line 2, go to Yonghegong (one stop from Dongzhimen) and then change to line 5. On line 5, go south two stops to Zhangzizhonglu. If coming by airport bus, you can take a taxi to our hostel once you get off at Dongzhimen. A taxi should cost between 10 and 15 RMB. From Dongzhimen you can also take bus no. 106 to the Weijia Hutong stop. Once you get off the bus, cross the street, go left a short distance and then go right down Dongsi Jiutiao. We are on the right-hand side about five minutes in. Beijing is a huge city, and the traffic is very busy, Immediately after booking your room, you will receive a confirmation email. We offer airport pickup for 80 RMB for one person, or 140 RMB for 2 to 3 people. If arriving at the Beijing West Train Station, we can arrange pickup for 30 RMB per car. We can pick you up for free at the main Beijing Train Station. By public transportation from the main Beijing train station, take bus No. 24 and get off at Dongsi Jiutiao station. Tickets are 1 RMB per person. from Beijing west train station, take bus No. 823, get down at Zhangzizhong St. station. 25kilometers far from Beijing airport, take airport bus to dongsi shitiao (the 10th of Dongsi St.).